The second annual Oklahoma City Arts Council / Bring Back The Music Summer Music Work Camp was held on the campus of Millwood Public Schools in Oklahoma City. The camp ran for five weeks, starting Monday-June 1st, 2015 and ending on Thursday-June 30th. Our work camp provided a supportive environment for young musicians to have fun playing music with other youth, while developing their music and teamwork skills at the same time. Students were provided the opportunity to perform in bands, vocal ensembles and as solo artists. 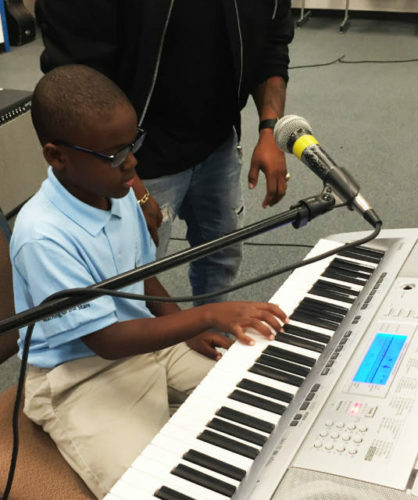 Whether they had never picked up an instrument before or were curious about trying a new one, the camp offered a chance to learn some basic skills on guitar, bass, drums, keyboards and vocals, all in the context of learning to play songs in a band. Top professional musician-instructors conduct all of our classes. Our instructors create a fun environment, while teaching students the skills they need to play in a band — and make new friends in the process! For additional information you can email Johann Kimbro at johannkimbro.bbtm@yahoo.com.